Drive in, Back in, or Pull Through site available. Spacious, sunny sites or cozy. Shaded sites excellent shower and flush toilet facilities. All sites have a picnic table and a fire pit. Swimming, fishing, hiking trails on site. Walking distance to grocery store and other shops. 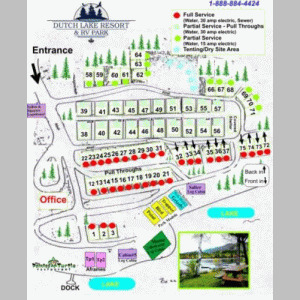 Please visit Dutch Lake Resort - RV Park Website.